Somebody recently told me that I will be able to compose more pleasing pictures if I use the Golden Ratio instead of the Rule of Thirds, and that the Rule of Thirds was an inferior way to compose photographs. What is the Golden Ratio, how can I apply it to my photography, and why is it better than the Rule of Thirds? 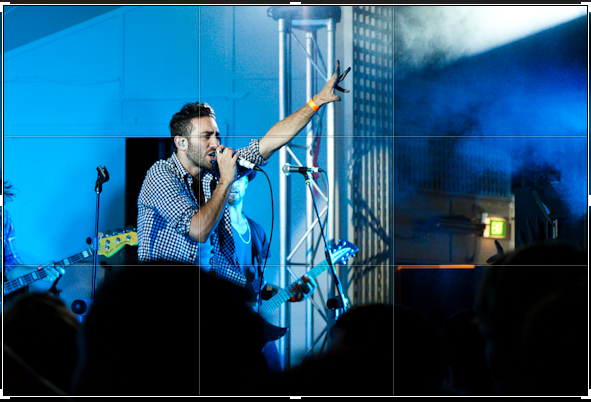 The Rule of Thirds is a grid division into even thirds (33/33/33). The Golden Ratio is approximately a 62/38 division. The Golden Ratio leads to the intersection of important diagonals. When composing a scene, there is nothing that says you can't apply both rules. Dividing a scene into 9 cells on a 3x3 grid is easy and quick, and many camera viewfinders/LCD's already present us with such a grid that we can work with. Note the point of convergence of the red and green lines. 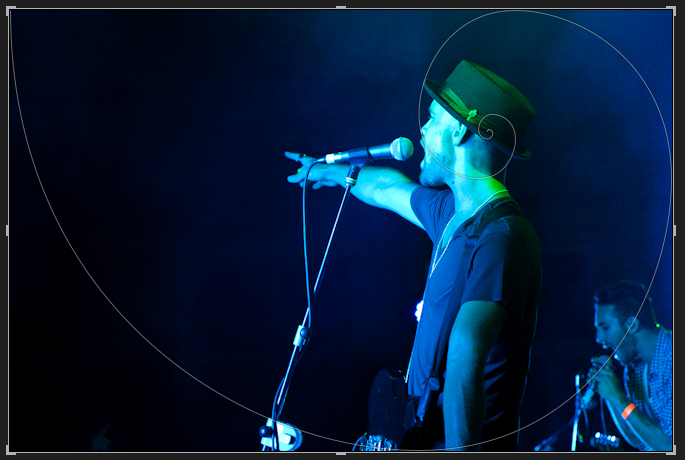 That particular point is the key point when using the Golden Ratio in photography. The simple rule here is to start from one side of the image, and visualize a square starting from that edge. Bisect that square along a diagonal. Bisect the entire image from the opposing corners, and place the key element of your key subject at the intersection of those bisecting lines. In the case of a portrait (where this rule is commonly used), you would want to place the eyes right around the point of intersection. You can also use this rule to photograph still subjects. It should be noted that the Golden Ratio is infinitely divisible (as you can see in the spiral image above), so you could identify multiple points of intersection for sub areas of a photograph, and place key still subjects at those points. You also have the option of following the spiral, and placing key subjects at the intersection of any two lines and part of the spiral curve. Background: I am a mathematician. The golden ratio certainly exists mathematically, it does appear on occasion in nature (though not as often as people think) and when it does occur then there are proper scientifically falsifiable theories as to why it occurs (the spirals on a pinecone are one example, I believe, though the spirals on a nautilus are not). However, it is equally well known that if you take enough different measurements then you will find any number or ratio that you want to find. Simply finding the golden ratio somewhere is not anything exciting. Explaining why it should be there is the important thing. As to its presence in art, I have nothing to say. I'm a mathematician, after all. But that's by-the-by and has already been adequately covered in all of the other answers. What I haven't seen yet is an image with the direct comparisons. So here is one. 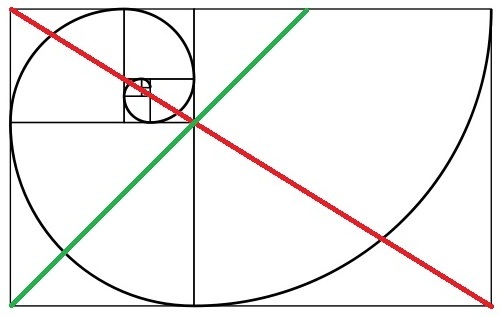 In the upper picture, the green lines are a third of the way in from the top left corner, the "golden" lines are the appropriate version of the golden ratio in from the top left corner. As many have said, there ain't a lot in it. The bottom picture refers to something I'm a little surprised hasn't been mentioned. That is that the sensor size, and the size of the "standard" photograph, aren't in the correct ratio for the golden ratio to be correctly applied! For a photograph to be taken seriously as "having the golden ratio" property, then I'm afraid that it would need to be sized in the ratio of 1:1.6180... The standard photograph should thus be 4 inches by a shade less than 6.5 inches. Essentially the Rule of Thirds is a simplification of the Golden Ratio. 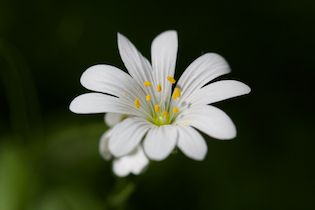 The golden ratio is about 1.62, but for photography, we'd typically write its inverse, of .62. There is a whole host of stuff on this ratio, but let me just say that it's significant in terms of beauty. The rule of Thirds actually comes from this same source, it's just an approximation of the Golden Ratio Rule. The rule of thirds would have a ratio of .67, which is pretty close to .62. All of the same tricks that apply to the Rule of Thirds apply to using the Golden Ratio. Rather than explain them all again, I'm going to point you to this question. The bottom line is, if you have an exact third line drawn, you should go slightly to the inside of it, and it'll be a slightly more pleasing location than the exact third point would be. Here is a real world example. I took this shot last night and the way I framed it landed on the Golden Section. I have cropped both images to maintain the same field of view, as pictured. The original was slightly larger but still landed on the GS. Now what happens when you crop to create a composition on the rule of thirds? To me, both have merits, though I'm a sucker for the Golden Section. 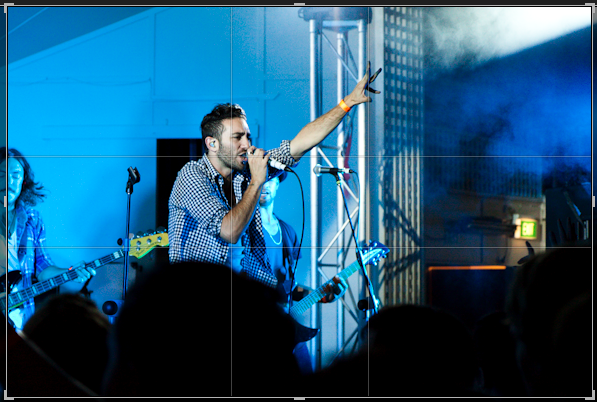 In the Thirds example, he's a little too far left to really nail the composition. That's totally my opinion though. You can see that I prefer to frame my shots using the golden ratio even if it's competely in my head (maybe it's golden because it comes to me naturally haha). I think to compose with either isn't so much an issue of correctness, but more of personal taste. This is the band, Amy Meredith, by the way. There are a lot of "magic numbers" in math, lots of folks are familiar with Pi for example. In this case, the number in question is Phi. Where it comes into visual arts like Photography is that you can construct a very graceful spiral shape that mathematically approximates Phi. Since that curve is viewed as being very graceful and classically beautiful, the argument is that that ratio itself must be, so we should use it. Or, in simple english: the ratio of the little part to the big part, is the same as the big part to the whole thing. There's a SECOND way you can leverage the golden ratio, and that's by image AREA. There's a classical image that demonstrates this, but I can't find it online for the life of me, and there's just a ton of folks that tried to mimic it, but didn't understand it... so searching for the image with google image search is utterly pointless. But here's a thought exercise to explain it. The image is a simple leaf laying on the grass, or a brightly colored Koi swimming in a dark pond. Some small element on a larger area with a striking visual difference, be it color, texture, whatever. Let's use the fish as our example. Say that in the area of the print, the fish occupies 10 square inches total area. The rest of the image then would need to be sized such that it satisfied the above ratio. So let's say roughly 16 square inches. The two together then are roughly 26 square inches; so if you print the image as a 4x6.5" print then your koi will occupy the golden ratio of the image and will be, in theory, classically proportioned and beautiful. The golden ratio being important to photography is a bit of a myth to be honest. The value is the only number whose reciprocal is exactly 1 less, and it has a few interesting mathematical properties see cabbey's answer for more details. Supposedly you find the golden ratio all over the human body, and the proportions of a "beautiful" face (Tom Cruise is often used as an example) all follow the ratio 1.61803399 but when you evaluate the results closely turns out that the features only approximately follow the ratio. And given enough measurements of any face you'll find lots of measurements that are about 1.5 times each other. Psychologists have done experiments where they have shown people rectangles with varying proportions and asked which they found more pleasing. Rectangles whose ratio was the golden ratio were not rated any more pleasing overall. I'll see if I can find the reference. As normally applied, the rule is used for dividing compositions into logical sections both vertically and horizontally (as in division of sea, land, and sky), and also by using the intersections of the horizontal and vertical third-lines as placement points for objects of interest in the composition. This isn't necessarily worse than the golden section, and, unless the object is very small, is generally close enough to the same that any harmonic/beautiful/mystical properties that apply to one might apply to both. When using a frame with a 3:2 aspect ratio — as in 35mm film or in most current dSLRs (the 4/3rds system excepted) — the rule of thirds happens to hit another compositional technique intended to produce harmony, balance, and geometric "satisfaction" in the viewer. If your rectangle is twice as wide as it is high, the line is — somewhat boringly — right down the middle and the two squares are side by side. 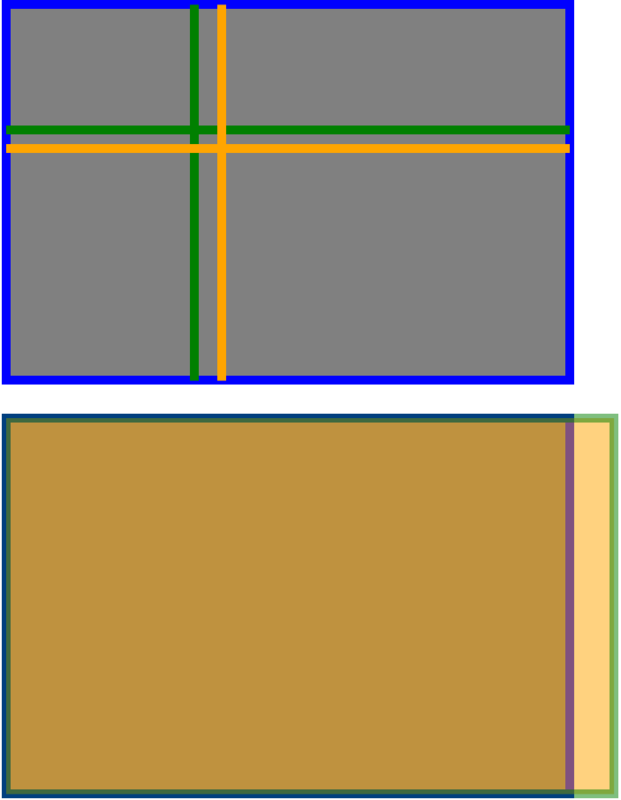 If the rectangle has wider proportions than that, the squares don't overlap. If it is narrower, they do. And in the case of a 3:2 frame, the rabatment lines happen to exactly correspond with the rule of thirds lines. So, with a 3:2 frame, if you buy the theory that rabatment produces harmony, balance, and general satisfaction, the rule of thirds — at least along the wide dimension of the rectangle — may have a harmonic advantage over the golden ratio. If you take a look at the classic "golden spiral" image (shown in cabbey's answer here), you'll note that the aspect ratio of the frame is the golden ratio, and the spiral is produced by drawing the rabatment lines that match that ratio. In fact, this may account for some of the feelings of balance and harmony ascribed to that shape — not the particular ratio chosen at all. If you look at Nick Bedford's answer, you'll find an example of a spiral inscribed in a 3:2 frame using the golden ratio rather than rabatment. To me, this spiral appears squished and non-elegant, and it was considering that along with Andrew Stacey's answer which led me to explore the idea of "natural" squares within rectangles, only to find out that it is in fact an established principle with an official name and everything. In investigating this, I was surprised to learn that there's surprisingly little hard evidence of the historical use of the golden ratio in art. While Euclid wrote about it around 300BC, he merely noted it as interesting mathematically. And it appears to have been lost in the dark ages, and didnt't resurface widely until Italian mathematician Luca Pacioli wrote a book around 1500 in which he described the ratio and named it "the divine proportion". (It wasn't called the "golden ratio" until some time in the 19th century, in fact; it got that name from German mathematician Martin Ohm in 1835.) Leonardo da Vinci drew illustrations for Pacioli's book, and so clearly he knew of the ratio, but he espoused a different theory of proportion, the Vitruvian system. In fact, Pacioli also advocated for that system for aesthetics — the significance he attributed to 1:161803... was religious — hence the divine label he gave it. From Pacioli onward, many works of art are widely suspected to employ the golden ratio in their composition. But direct confirmation from the artists is surprisingly hard to come by. (I'd love to see some references if you can find them!). And since the elements of the paintings, sculptures, and etc. which are said to use the golden ratio in one way or another often line up only imprecisely, or when carefully selected, it's hard to conclusively demonstrate. In fact, even if we accept that the golden ratio does have a certain aesthetic power, perhaps the Renaissance masters simply used similar proportions unconsciously. It turns out that it isn't until the 19th century that suddenly the golden ratio conclusively becomes important to composition. German intellectual Adolph Zeising put forth a comprehensive system of aesthetics built around the ratio, and this appears to have caught the interest of a number of artists — particularly, the Cubists found it interesting, and an artist named Paul Sérusier wrote about it in a book on composition in 1921. But, really, it seems that most of our modern conception of the aesthetic value of the golden ratio can be traced to Zeising! That, of course, doesn't mean that he was wrong inherently. It's just very interesting to know where these ideas come from. Note that rabatment is also without a long, distinguished pedigree — while there's plenty of suggestion that the rule may have been used in some Renaissance-era compositions, the name seems to have been first applied by Charles Bouleau in 1963. So, in summary: the golden ratio and the rule of thirds are different tools to help with placement of lines, divisions, and other elements in composition. They're similar, but aren't directly related. One isn't necessarily better than the other. With a 3:2 frame, the rule of thirds applied along the long dimension of the rectangle happens to match another harmonious geometrical aspect, which is nifty and may be useful in composition on its own — painters using this technique certainly aren't constrained to 3:2. The golden ratio and the rule of thirds are similar but competing recommendations for dividing the frame of a composition (in painting, photography, film, and architecture). It's often also given that the intersections of these divisions may provide strong points for aligning objects of interest. The golden ratio suggests that the division of lines or of areas should be in the ratio of 1:φ, or approximately 1:1.618. The rule of thirds argues for ⅓:⅔, or simply 1:2. In either case, intersections of horizontal and vertical lines dividing the frame at the given ratio are often considered to be "power points". The rule of thirds as an actual rule was invented by a minor British artist and commentator, John Thomas Smith, in 1797. He doesn't give a strong rationale for his choice. The primary argument is that evenly-weighted composition suspends the viewer's attention rather than leading it. He doesn't given a specific argument in favor of 1:2, but simply claims it to be "much better and and more harmonizing" than "any other proportion whatever". The golden ratio, as a tool for aesthetics, was popularized by a minor German intellectual, Adolph Zeising, in about 1854. The ratio itself was known to Euclid and in 300BC, but he simply noted its mathematical interest. Luca Pacioli wrote about it as "the divine proportion" around 1500 at the dawn of the Renaissance, but it didn't really catch on the way people now think it did. Pacioli used the word divine because he found religious significance, not an aesthetic one. Much later, in Germany in 1835, the ratio got the name "golden section", which Zeising picked up and expanded into a comprehensive theory of the universe. This theory is much more developed than Smith's rule of thirds, but ultimately it's an artifact of the Romantic Era, and hinges on the idea that elegance in pure mathematics must indicate some corresponding beauty in reality. So: while there's certainly plenty of experiential evidence that off-center composition works, the magic of these particular exact rules is quite dubious. They also do not have the long history of use in art that many people attribute to them. They may have special power — and certainly there's a wide body of 20th-century literature in support of that notion — but don't put too much stock in their precise values. I think people would really like to have a magic "make this composition good!" button — but there's really no such thing. Or if there is, we haven't yet found it in these rules. I find this information interesting but I need to share in my words information I gained from Axel Bruchs book on composition. In brief he said that on a blank or mono coloured frame the golden ratio aplies in the macro format of the frame, however as soon as a picture element enters the frame it infleunces the composition as well as peoples preference of the frame format. He states that his research shows that approximately 6% of artists used frame formats using the golden ratio and the majority prefered formats that were closer to 1.2 and 1.4 ratios.of these can be asumed to be influencedd by the subject matter. e.g. in modern landscape or architecture a photographers is starting to prefer > 1.8 formats. Even preferred movie formats is folowing suit. The terms stability in a picture is bandied about and the term is further enhanced by the balance and in balance concepts. I believe the subject determines these in agreater sense and for imovable objects such as classic arcihtecture the use of the golden rule make sense. But why would you want an athlete or dancer in perfect balance/stability when the intention is to provide a sense of imbalance. Some said that the rule of thirds produce a slight imbalance that enhances these subjects. I dont know... A picture just feels right to me as either in balance or not and is informed by many aspects of a complex picture such as tilt tone an blur. Sorry... I my right brain is too dominant today! Not the answer you're looking for? Browse other questions tagged composition composition-basics rule-of-thirds golden-ratio or ask your own question. Why do breathtaking views turn into “boring” photos, and how can I do better? How to create an eye-path? When should I break the rule of thirds? Rule of thirds — is there any scientific proof behind it? Why is the Rule of Thirds rarely followed in macro? How can I make a picture like this one of a bridge in green landscape seem less plain? 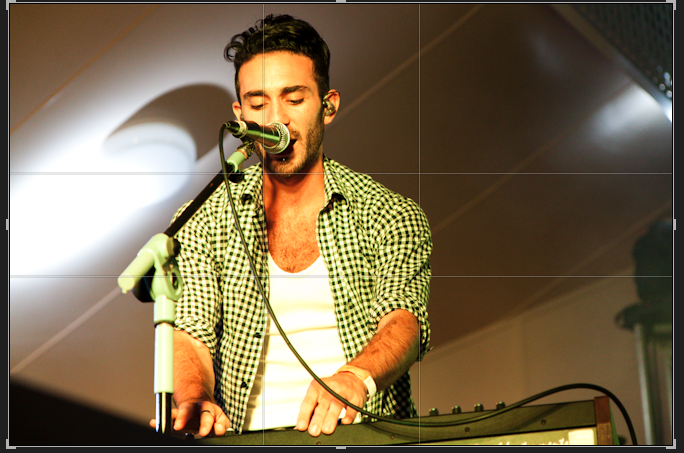 Is there a way to display golden ratio and the rule of thirds on a Canon DSLR?